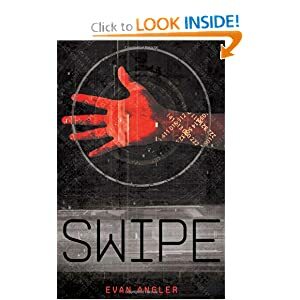 In Swipe's post-American, heavily technological landscape, the world is sharply divided between Marked citizens who can work, shop, and vote and the dispossessed, oppressed Markless. At the dawn of a new school year, twelve year old Logan's world begins to implode when his paranoid suspicions that he's being stalked are terrifyingly confirmed. Meanwhile, thirteen year old Erin discovers some startling truths about her father and wrestles with challenges of her own. Together, the two unexpectedly find themselves over their heads in a complex, high-stakes battle to save Logan's life and keep Erin's family together. This is one of the first real page-turners I've read in a while. Once the story begins rolling it picks up pace quickly and leaves you eager to test your theories and spin around the plot's next twist. It was initially a little disturbing that so much of the action was confined to characters who are really little more than children, but ultimately it works. Their motivations and logic are understandable and reasonable, and none of their actions are out of place for their ages and situations. Angler writes smoothly, carrying deeply readers into the story. The hints, clues and quiet themes woven throughout enrich the story and lay solid groundwork for the sequel to come. I enjoyed this, and found it both clean enough and engaging enough to confidently hand to anyone to read, pre-teen to adult.